A few years ago I started becoming interested in men’s personal grooming. I’m not exactly sure what first got me interested in it. Maybe I didn’t like the way my skin reacted to these quadruple blade systems, maybe I actually cared about my skin. Maybe I didn’t like spending a fortune for new blades every month. Maybe I didn’t like having to charge up some overpriced electric razor. Maybe I wanted to feel like a man. I am far from knowledgeable or even experienced but I look forward to shaving every day and want to share my limited experience. Every morning I make sure that I give myself a little extra time to do it right. Sometimes I go as far as lighting a candle (for that extra bit of relaxation, candles will be another blog entry). If I don’t shave right after a shower I try to relax my skin with a hot towel that I prepared using a little bit of Vick’s VapoRub. I use Taylor of Old Bond Street shave soap. I’ve been in love with their lavender scent but I haven’t yet used a scent by them that I don’t enjoy. I will on occasion use other brands of shave soaps, such as Geo F. Trumper and Proraso. I use a generic ceramic shave mug to hold the soap and I use a new pure badger hair shave brush from the Art of Shaving. I had a cheap brand when I first started out and it fell apart. Upgrade to a better shave brush. Your skin will thank you! As far as my razor goes I use a long handled Merkur safety razor. I originally used Merkur double edged blades but now I use Feather brand. Some blades are sharper than others, and no, sharpest isn’t always better. I find that it depends on your shaving style and skin type. As for aftershaves, this is completely up to you. Back to my reasoning of shaving this way, it’s because I want to feel like a man. Therefore, I exclusively use the manly “old school” aftershaves, musky and spicy. In fact, I don’t think I use a single contemporary aftershave. The aftershave I use the most if Clubman Pinaud. Clubman has been around since the early 1800’s and it was one of the first aftershaves I used and is my goto when heading to events. 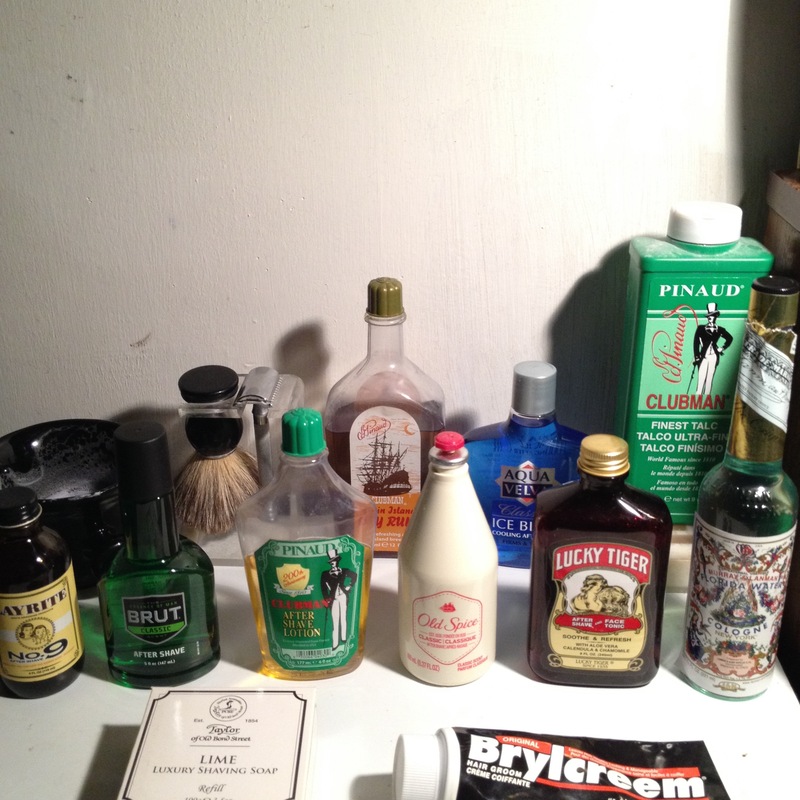 If I have an evening dinner date or small party I’ll use a bay rum, bay rum from different brands does have it’s own unique scent but for the most part they’re spicy and ready to liven up a party, I use Pinaud’s bay rum or Layrite No.9 bay rum. I will also splash them on for my daily going ons as well as a few others that I use regularly too. During summer I tend to use Lucky Tiger, Aqua Velva and Florida Water (another aftershave that has been around since the early 1800’s). Other aftershaves in my rotation are Old Spice Classic and Brut Classic, 2 scents that are recognizable, relaxing and great for the daily grind. There are so many aftershaves available, like I said, everyone has their own tastes as to what they wear. There are a few aftershaves that I would love to get someday; Canoe, English Leather and Stetson. If anyone cares to gift me a bottle of any I would be forever grateful! Thanks in advance! Fascinating essay! Back when I was a younger man, I used an old standard used by many GI’s during WWII. It was a “Rolls-Razoe.” It had a built in “strop” along the bottom surface of its carrying case. It was the closest thing I ever found to the “straight razor.” My beard is VERY slow growing and when I was young, it was blond. Now that I have piled on the years it is white. I gave up the shaving brush and “Williams” shaving cream back in the early 50’s when I began to shave. (I had “peach fuzz” right up to to 1952 or 3) I started with Gillette “Blue Blades” and also an oldie known as “Personna,”then to Schick “Injectors and up to the recent past fell for that stupid and very EXPENSIVE “Fusion” junk which is overpriced, over rated, and no better than a good sharp single razor. Now, as I find my hand not as steady as in days of yore, I have gone with “Harry’s” which are EXCELLENT multi blade razors with removable cartridges. I get at least 5 shaves out of each insert before I replace it. You have really recalled some of my MANY past grooming tools. I still use “Brylcreme, a little dab’ll do ya, Brylcreme, you’ll look so debonair. Brylcreem, the girls will all peruse ‘ya, they’ll love to run their fingers through your hair!” I also loved Jeris when hair tonic was in style, “Tiger as you have in your illustration, and my old and now deceased barber Carl Amato used his father’s special brand which had a delightful lavender-rose lasting aroma. As to Old Spice, never particularly interested in it as almost all guys wore that stuff. A few years ago I’ve joined the world of wet shaving. A lot of experiments, a bunch of money spent, a lot of brands, products, etc…. At the end of the day now I know, that for me the best pre-shave brand is Proraso, the best after-shave brand is Old Spice, the best safety razor brand – Merkur. Everything else is worth to try but not to use all the time. Again, it’s just my opinion.